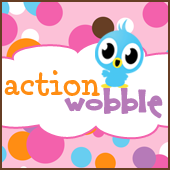 Action Wobbles: Have a blast!! It's Melissa with Moe Creations and it's my day here at the Action Wobble Blog!!! Here is a cute and simple card for your inspiration, would be just perfect for a little birthday girl!